A post? On Shabbat? What can I say…surprise! Funny story: I am not a huge fan of the word “surprise.” I wish there was some high-level, super sophisticated, quasi-hipster reason for it, but really, it all goes back to Ms. S. Ms. S. was my awesome middle school science teacher, save for one thing: her pop quizzes. Ms. S. did not call her quizzes “pop quizzes.” She felt that was too stressful. Instead, she would wait for the bell to ring, warmly greet the class, put her hands confidently on her hips, and in a sing song-y voice, whisper, “surprise, surprise!” Almost a decade later, the phrase still haunts me. Shudder. Today, however, I have some nice surprises for you. I was feeling a change. I’m super new to web editing/designing/pretty much anything not Google, so it’ll be a work in progress. Love it? Hate it? Could care less? Let me know! 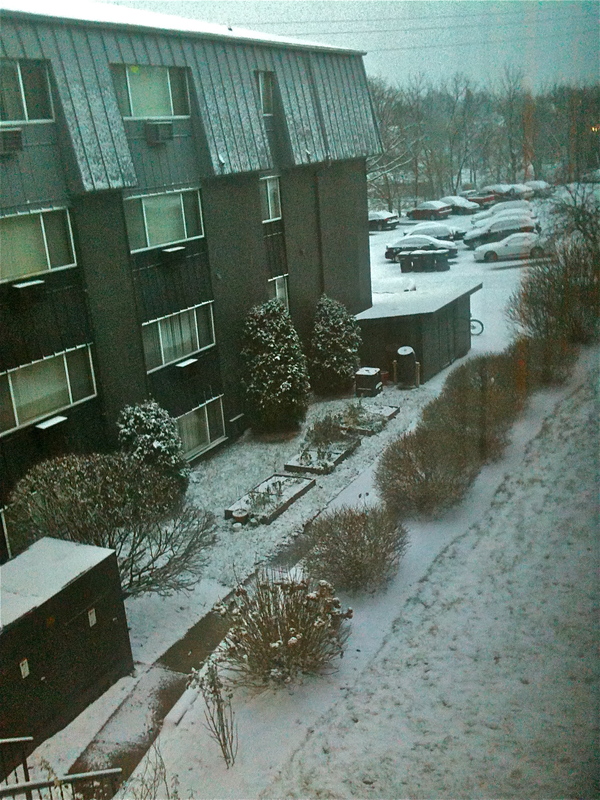 Waking up was not super fun this morning – until I saw THIS!!! SO happy. It was just the right amount for the first snow: enough to make you pay attention, but not too much to overwhelm you right out of the gate. I love you, snow. 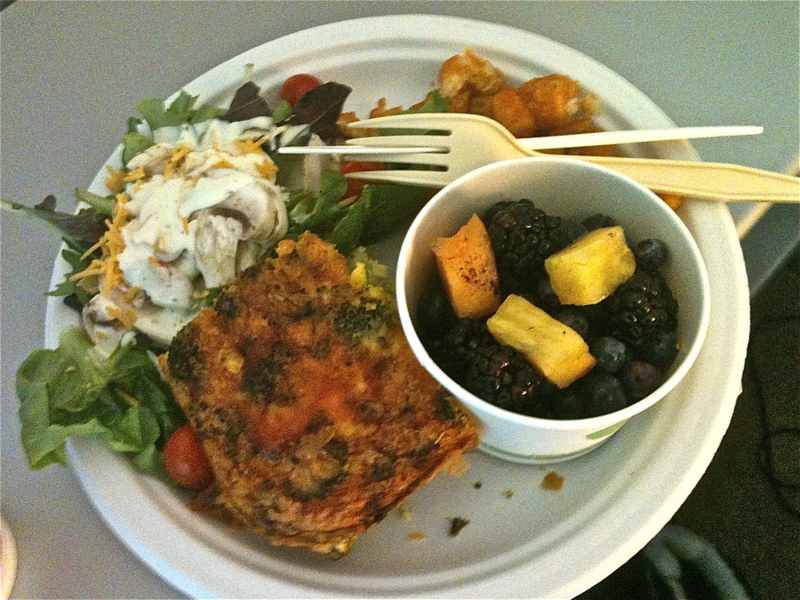 Broccoli quiche, salad with veggies, home fries, and a big ol' cup of blueberries, blackberries, and pineapple. Hello, antioxidants! Not only beautiful, healthy, and delicious, but cheap! I payed $4.82 for the whole shebang. $4.82! Coffee at Starbucks can be more expensive! Mmmmm. A good reminder that great food can truly be found anywhere. I’ve virtually always been a Reform girl with Reconstructionist leanings (and at times the other way around). Nothing against the other branches of Judaism – these are just the ones that work for me personally, and allow me to have a healthy, fulfilling spiritual experience. That’s not to say, however, that I don’t want to learn about and celebrate others! I’ve worshiped with a variety of people of variety of faiths, and it’s always such an interesting experience. Tomorrow, a friend from my Torah study and I will be checking out our local Conservative Synagogue to see what it’s all about. I’m a huge fan of learning about anything, particularly religion, from first-person experiences, and am really excited to have the opportunity to celebrate Shabbat with what I’ve heard is a great community. I’ll give a run down in a future post!